We'll call the stuffing and wires and terminals 1kg all up, too. 13 + 1 + 1 + 1.9 + 1.9 + 0.5 + 0.5 + 0.7 = 20.5kg or there abouts. I guess if I Pull the woofers out and pull the cheap stuffing out and fill them full of clothes or something, I can put up to about 8kg more in a bag with them. 0.338 * 0.3 * 0.019 * 2 * 800 = 3kg less if I whip the sides off and replace them later. 17.5kg if I do that. Bag weighs 3 to 4kg so I'm pretty much using one bag just for these even if I remove the sides. On the brighter side, the sides were 2 or 3mm too short anyway and would be nice to replace. On the other hand, the toroidial transformer is 2.2kg alone, plus the heatsink and caps and old cassette deck enclosure. Looks like standard Spanish air mail will be ~200 euros if I send 30kg of stuff. 150 if I send 20kg of stuff. With current exchange rates, if postage + declared value exceeds 235 euros, I'll have to pay another 100nzd of tax or more. 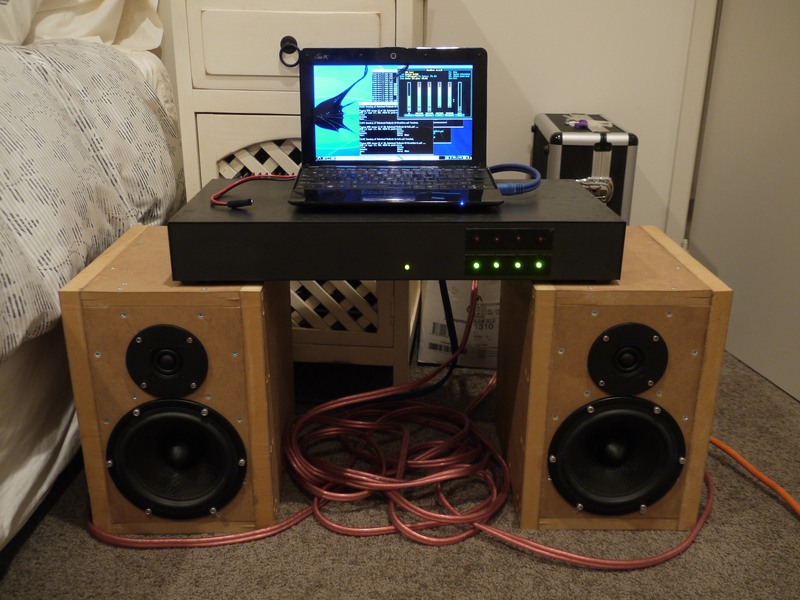 What I might do is combine old amp with speaker boxes, take the drivers out, and declare the value as 0 or close to it, which is what some scrap MDF and screws cost me in NZ. The old amp casing was free too. Weight, if I ditch the drivers, will be roughly 15.7kg for the boxes, 12.7 if I rip the sides off. I need to know what the amp setup will weigh in total. Basically, if duty + tax is 60nzd or more, they also sting you two more fees. Duty on speakers is 5%. Duty on cassette decks/recorders/players is 0%, but the duty is not on the postage, so it's OK. I think I have a plan! Currently my gross cost/value has to be 243 euros or less, preferably a lot less. It's looking like it'll be less than 150 euros for postage at the current weight of around 17kg with packaging. This leaves me 93 euros max for value. 10 euros covers the MDF cost at home to recreate what I did. 30 euros covers the toroidal transformer and assorted other junk inside the free cassette deck. Fair and honest in terms of replacement values! I have 30 or so toroidal transformers in NZ, so I wouldn't even need to buy that. The rest is typical cheap stuff. So I'll have to ship everything, ugh! I guess extra baggage weight won't be much of an issue, though. That's something. Maybe I can fit some other stuff in the bags instead. ^ sides. These boxes no longer have sides. I need to give them new sides. Preferably a bit thicker than the last ones. I have a half sheet 2400 x 620 that I can use. I'll get 4 out of it very easily, less than half of it, and it's thicker. How much? /me goes to check... 24mm or maybe 25mm. That'll make it slightly out of proportion, but I can fix that later with the hardwood skin thickness on the bottom and/or top. Or perhaps I should consider the posts for the future incarnation up front and not make it more difficult than it needs to be to fix that later. Keen to reassemble them and attach a proper amplifier for the first time (I have several to choose from, now). Which hardwood should I use for the skin? I'm thinking something kiwi would be nice. Rimu? Kauri? Macrocarpa? I don't really want to go foreign, especially not something unsustainably logged from South America or Asia, that's not cool. Not teak, not my style, too dark. Perhaps left-over kwila, laminated together? Minimum 4mm thickness, maximum 13mm thickness, preferably 10 or 12, I guess, to ease assembly. Thin will get fussy and crackable. Thick will want to hold its own shape and tear apart. Hence medium is good. Enough musing, maybe I'll get onto putting them back into service in the next few days. PS, I have all of my stuff again! Nothing lost of damaged, that I've seen, so far. Only unopened thing is amp/boxes package. Yesterday I extracted the speakers and amp skeleton from the most excellent box ever. I also managed to get the piece of 24mm MDF out from where it was being used as a shelf and replace it with scrappy 18mm x 300mm strips instead. Good progress. Also today: TODO list created for bringing these suckers back to life! Shopping list is integral to the TODO list. Need to go shopping for some T-nuts, screws and glue and deadening material before I can proceed further. Then I can get stuck in and put them back how they were, or a little better than that. I've decided to risk not installing T nuts as it would be difficult to do a nice job as it stands. I asked my old man to give me a hand cutting the new sides, and he did, but it wasn't ideal, as he didn't realise I didn't intend to do any sanding of the MDF and wanted it "OEM" look. Ahh well, the thread title does say "NO Aesthetics", and it's still not that bad. I plan to laminate some NZ hardwood over it all at some point anyway, so it's not a huge deal for the MDF to be a little rough for the time being. Screws, 45mm multi-head (really good design) passivated zinc self tapping wood screws. 200. Cheap PVA to stick the sides on. A decent tin of ADOS F2 for gluing the deadening material to the sides. The sides cut and marked for deadening glueing. Mark and drill the sides ready to screw on. Find and buy some deadening material (wish I brought more from BCN now) and glue it on. PVA the sides and screw them down hard. Solder on and screw in the drivers. Dig out my amp and cables and give it a whirl. Next job is to bi-amp them with a 24db/oct linkwitz riley e-xover. A fair bit of coding to do before that, though. Future iterations include electronic crossovers and hard-wood outer skin (8 - 15mm thick).